Click here to purchase it from iTunes. Click above to hear our performance on WFUV's Morning Breakfast Show with John Platt. We go on about midway into the third hour. Click above for an Artist Direct interview with Zak about the new album. Click above to go to an interview with PopWrapped about the new record. Thanks to Mike Ragogna at the Huffington Post for the interview! Click above for Magnet Magazine's feature on the title track off of Signs of Life. Thanks to The Jersey Tomato Press for the interview. Click here for The Aquarian's review of Signs of Life. Thanks to my good friend Matt Kacar for having me on the Artist Connection Podcast! Click above for an Examiner Article about Signs of Life. Thanks to Gwen Orel at the Montclair Times for the Signs of Life review! Thanks to Edward Huerta for the review at Rock NYC! Thanks to Brad Bershad for the review today at Zumic.com! FALCON RIDGE FOLK FESTIVAL TODAY! Today we play at the Falcon Ridge Folk Festival. Very excited to be one of the bands chosen to play there! Thanks to Jatinder for interviewing me for TO Lifestyle. Thanks to WAY TOO INDIE and Manjot Jawa for their time and the video interview feature. Thanks to BROKEN RECORDS Magazine and Adrienne Renae on the nice interview feature. ZAK CONTINUES TO GROW...read on. Thanks to Star Pulse and Brittany Frederick on the nice interview and write up. Thanks to BlowUpRadio and Lazlo for the top albums list of 2013. The Precambrian Age made #8. Check it out "Lazlo's Top 65 NJ Albums of 2013". Thanks to New York Gossip Gal for featuring The Precambrian Age on a cool short write-up. Check it out "All Heart and Soul". Thanks to Jersey Beat, Jim Testa, and Joe Wawrzyniak for featuring The Precambrian Age on a cool short write-up list among some great artists. Check it out HERE. Thanks to Infectious Magazine for featuring the breakdown, track-by-track, of The Precambrian Age. Take a look HERE. Thanks to The Alternate Root Magazine for featuring a song of mine on their top 10 songs of the week. See which one HERE. Thanks to Matt Kacar and Artist Connection Podcast for the interview. Listen HERE. ALBUM RELEASED TODAY - SHOW TONIGHT IN NYC! The Precambrian Age is released. Tonight's the release show @ The Bowery Electric. Get there early to grab your free album and say hello. Hope to see you there. Thanks to Peter Braidis and Indie-Music.com for featuring THE PRECAMBRIAN AGE. It's a great write up, read it HERE. For an entire week, Tuesday Oct.8-15, I'll be streaming THE PRECAMBRIAN AGE for free here on my site. Listen HERE. Thanks to YAHOO! VOICES and Jolie du Pre for featuring Zak in their entertainment piece HERE. Thanks to FOX CT For having Zak perform LIVE on their Morning Show. Watch it HERE. Also, thanks to The Montclair Times, Gwen Orel, and NorthJersey.com for featuring Zak. A very nice article and read.. Find it HERE. 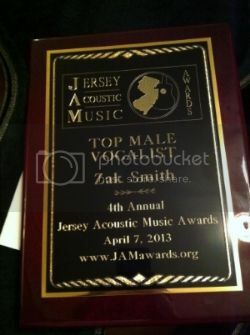 Thank you for all of your votes and support in helping Zak win the Top Male Vocalist award at the 4th Annual Jersey Acoustic Music Awards on Sunday. For Zak Smith, a song is never truly finished. He may have written, recorded, and released it on an album. He may have played it countless times at venues up and down the East Coast. His fans may even count it among their favorites. But a song—a good song, a sturdy and solid song, the kind you live with your entire life—is a living thing, constantly revealing new meanings and new possibilities with every performance. That idea fueled the New Jersey native’s new album, Signs of Life, which is arguably his most personal and certainly his most accomplished to date. A prolific songwriter for fifteen years, Smith has amassed an extensive catalog of tunes, many of which appear on his studio albums and many more exist only in demo form in his archives. For this project, he re-recorded ten songs from various stages of his career, updating them to reflect new technical abilities and new musical concerns. In doing so, the arrangements changed fundamentally, as Smith took what had been full-band rock songs, full of spiritually inquisitive lyrics and heart-on-sleeve drama, and stripped them down to their barest bones: guitar, piano, and his own finely grained voice. As a child in Montclair, New Jersey, Smith was a voracious reader who dreamed of becoming a writer (an early short story took second place in a statewide competition). It wasn’t until high school that he became equally voracious as a listener, thanks to a friend who introduced him to Bowie and Zeppelin, Hendrix and Lennon. Using his father’s old tablature books, Smith taught himself to play guitar and honed his ever-developing voice. This would guide Smith in his career as a professional musician, which began modestly when the eighteen-year-old college freshman played a coffeehouse open-mic night. Since that debut, Smith has played countless shows in venues of all sizes, written a full catalog of songs, and has recorded five albums and one EP. In 2013, he released The Precambrian Age, which at the time represented a creative and commercial peak: He won Best Male Vocalist at the Jersey Acoustic Music Awards and was featured in the book Are You Listening? The Top 100 Albums of 2000-2010 from New Jersey Artists. Signs of Life is his most powerful statement yet—an album that is simultaneously lush and austere, spontaneous yet deliberate, largely acoustic but with an electric charge to every note. These heartfelt, often brutally honest songs sound just as lively and urgent in 2014 as they ever have. Stay updated by joining Zak’s e-mail list from his website, liking his facebook page, or downloading his free smartphone app. Cocker were reborn as one." so ready for prime time..."